An individual in the United States sustains a TBI approximately every 23 seconds, and more than 25% of OTs have reported working with clients with TBI. Interrelated physical, cognitive, psychiatric, and emotional effects can influence a client’s capacities, activities, relationships, and roles for months and years after the injury. Advancements in medical care and prevention programs related to TBI have greatly improved in recent years, and the annual death rate has declined. This decrease, however, has led to a dramatic increase in the prevalence of people living with chronic symptoms of TBI. 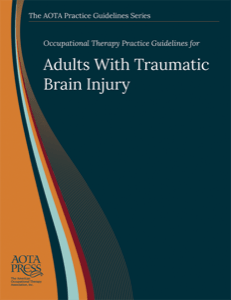 This Practice Guideline provides an overview of the evidence for occupational therapy to assist people with TBI in achieving health, well-being, and participation in life through engagement in occupations. It includes a description of the occupational therapy process for this population, defining the domain and describing interventions that occur within acceptable occupational therapy practice. Extensive attention is given to issues with arousal and alertness and cognitive, motor, visual, and psychosocial impairments. Appendixes include selected ICD-10 and CPT codes and searchable Evidence Tables on a flash drive for ease of use.